When the Germans invaded the Soviet Union in 1941, they were dealt a harsh lesson at the hands of the powerful T-34 and KV-1 tanks. Tanks with more armor and bigger guns were needed to counter these Russian beasts, but such new tanks would not be in production for one to two years. In the meantime, tanks like the Panzer III and IV would be up-gunned, but what to do with all the light tanks? These light tanks could not be re-fitted to mount a bigger gun, but if the turret was removed then a bigger gun could be mounted in an armored superstructure built on the hull. In effect, these Panzerjägers (tank hunters) would be self-propelled anti-tank guns. The idea of such a weapon was not new to the Germans. In the mid 1930's, Heinz Guderian, the father of armored warfare, noted the need for self-propelled artillery and anti-tank guns for the new Panzer divisions then being formed. Despite the need for such a weapon, only one such vehicle was produced before the Germans encountered the T-34, and that was the weak Panzerjäger I. Here are just a few of the many different self-propelled anti-tank guns that the Germans deployed in the early to mid war period. The Panzerjäger I shows off its superstructure. 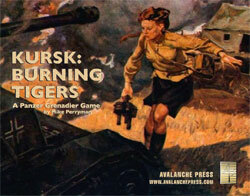 By early 1940, the Germans had finally realized that the Panzer I was obsolete. Plans were being drawn up to scrap the Panzer I's, but many ordnance experts didn't want to waste a perfectly good chassis. They instead wanted to mount a larger gun, but there was no way to mount a gun in the tiny turret of the Panzer I. It was decided to mount a 37mm anti-tank gun in a fixed superstructure. This was the same gun mounted to early Panzer IIIs, but as the Panzerjäger I was being designed, it was becoming clear that the 37mm gun was losing its punch. Instead of that gun, a more powerful 47mm Czech-designed anti-tank gun was mounted. The final result was a crude and simple conversion that consisted of nothing but the removal of the turret, the addition of a platform for the two gunners, and of course the fixed superstructure. The Panzerjager I saw service during the early stages of the invasion of the Soviet Union where it encountered the powerful T-34 and KV-1 tanks. It also saw a great deal of service in North Africa in 1940 to 1941. While it mounted a powerful gun by 1940 standards, by 1941 the 47mm gun was losing effectiveness. It also had many other flaws such as a thin gun shield that only protected the front of the vehicle, as well as a high silhouette that made it vulnerable to the enemy. By 1942 these defects had become intolerable and later that year the Panzerjäger I was taken out of frontline service. A total of 132 Panzerjäger I's were produced and many continued to fight partisans and perform security duties until late 1944. The Panzerjäger I appears in Fire in the Steppe, 1940: The Fall of France and Road to Dunkirk. Flawed yet effective, the Marder II. By 1941 the Panzer II was obsolete and plans to remove the outdated tank from service were being prepared. Like the Panzer I before it, nobody wanted to waste a perfectly good tank chassis. So early that year work began on a self-propelled anti-tank gun based on the Panzer II chassis. Known as the Panzerjäger II, it was to be built along the same lines as the Panzerjäger I. The Panzerjäger II, or Marder II as the troops called it, originally mounted a 50mm anti-tank gun. 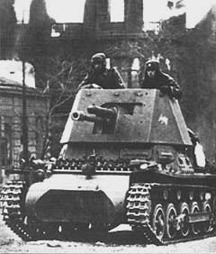 But after the invasion of Russia, having encountered the thickly armored T-34 and KV-1, the Germans knew a bigger gun was needed. So the designers decided to mount the new 75mm Pak 40 gun; then in hurried development. The Marder II was a typical Panzerjäger conversion having a 3-sided armored superstructure, a platform at the back for the gunners and ammunition storage as well as a few minor engineering modifications. The result was an effective yet flawed tank destroyer that gave the troops something with which to counter the ever-increasing number of T-34s and KV-1s. However, despite its effective gun and reasonable mobility, it was still poorly protected and the limited traverse main gun made it vulnerable when attacked from the side or rear. It also had the high silhouette that plagued the Panzerjäger I before it and all other Panzerjägers to follow. Despite these flaws, 1,200 were made during the course of the war and the anti-tank troops took full advantage of its mobility and powerful gun. Late in the war a number of experimental night fighting versions were produced using infra-red searchlights. The Marder II appears in Broken Axis. A Marder III captured in North Africa. The Marder III, officially known as Panzerjäger 38(t) für 76.2 Pak 36(r), was yet another conversion of a light tank made obsolete by the T-34. This time it was the Czech-designed Panzer 38(t) tank being converted. Design began in late 1941 when plans for all of Germany's tanks to be up-armed were being drawn up. The designers originally wanted to mount the 75mm Pak 40 just like the Marder II, but due to the great demand for this gun the designers instead had to use the 76.2mm Pak 36. This gun was actually an ex-Soviet field piece captured in great enough numbers that the Germans modified it for service against their former owners. The conversion of the Marder III was very much like the conversion on the Marder II, both having a 3-sided shield and a gun platform in the center. It began production early in 1942, and later that year the 75mm gun took place of the 76.2mm gun as supplies of the captured weapon were running low. Of these two models approximately 600 were built between early 1942 and early 1943. Both of these early models had the problem of a large gun and superstructure mounted on a small diminutive tank, which caused the Marder III to be front-heavy and under-powered. In mid-1943 a new model was issued to the troops that had the gun moved to the back and the engine moved to the front. These two changes fixed the previously mentioned problems and improved its poor mobility. Around 800 of this improved Marder III were produced between mid-1943 and early 1944. 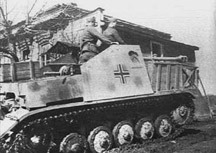 The Marder III, like all other Panzerjägers, had a high silhouette, thin armor and a limited traverse gun; the early models also had poor mobility. But the Marder III, like the Marder II, gave both a light tank chassis new life and the German Panzer troops an effective self-propelled anti-tank gun right when they needed it. The Marder III appears in Burning Tigers, An Army at Dawn and Liberation 1944.
re-named when the Führer objected to tanks named for insects. The Nashorn, also known as the Hornisse, was a standard Panzerjäger mounting an 88mm main gun, the same one mounted to the King Tiger. Unlike the other Panzerjägers, it was not a hastily converted light tank chassis. Instead it used a hybrid chassis using the hull of the Panzer IV with drive components of the Panzer III. The Hummel self-propelled howitzer also used this same chassis. The Nashorn's powerful gun gave it the ability to kill all but the heaviest Allied tanks at ranges of 2000 meters or greater. On the flip side the Nashorn had an extremely high silhouette, poor mobility and a thinly armored superstructure which was open-sided and -topped. It was also a maintenance nightmare, needing to be overhauled every 850 miles. It still was an effective Panzerjäger despite these flaws as its crews used its main gun to take a severe toll on enemy tanks before the enemy could even get within effective range. 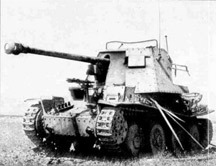 In addition to its tank killer duties, the Nashorn could be used as a self-propelled field gun, but it wasn't deployed in this role very often. A total of 475 were built between 1943 and 1944 and saw service with independent Panzerjäger battalions. This was unusual because most other Panzerjägers were issued to Panzer and Panzer Grenadier divisions, not to independent battalions. The Nashorn appeared in the out-of-print Secret Weapons, and will be back someday. Because Panzerjägers were not to be used as tanks due to their limited traverse gun and near-total lack of protection, they could not be deployed in the attack, at least without disastrous results. So the Germans formulated a novel tactical doctrine for Panzerjägers. Under this theory the Panzerjägers were to be held behind the lines in a single group. Once the enemy tanks appeared and made for a specific location, then the Panzerjägers would rush forward to counter them. They would then take up hidden pre-scouted firing positions and wait to fire until the enemy tanks had come within range. Once they did, the Panzerjägers would fire a few shots each, then retreat to avoid retaliatory fire. This tactical doctrine was similar to NATO's 1980s war plans to counter Soviet armor in Western Europe if WW III broke out. One major problem with this theory was that the Panzerjägers could not get up to the front before the enemy tanks had overrun it, due to the fact that Soviet tanks often just overran any German position encountered. Because of this they got caught advancing to their hidden firing positions and they were destroyed in the ensuing 360-degree combat, for which they were not suited due to their lack of main gun traverse. Even if they made it to the front line they were often unable to hide and wait for the enemy due to their high silhouette. Despite the failure of the theoretical use of Panzerjägers, they were still effective in defense and in support of true tanks, and from 1943 on the Germans were perpetually on the defense. In another article we'll discuss the well-designed late war Jadgpanzer. Take these tanks into action. Order Burning Tigers right now. Yes, now.